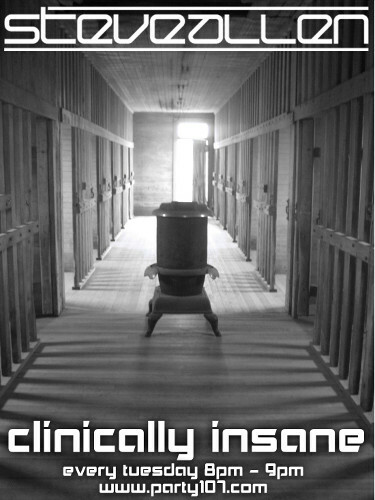 Party107 welcomes UK DJ and producer Steve Allen to our Tuesday lineup with his brand new show "Clinically Insane"! Trance Prodigy "Steve Allen" has seen his reputation grow by epic proportions in recent years, not only as an International DJ and Producer but also as an Engineer. With tracks appearing on the biggest labels in today’s scene, it's no wonder Steve has quickly become a firm favourite with the likes of Armin Van Buuren, Tiesto, Paul Van Dyk, Ferry Corsten, Above & Beyond, Judge Jules, Paul Oakenfold, Roger Shah & Markus Schulz. However don’t pigeonhole Steve as just a production wizard, his energy and enthusiasm behind the decks has lead him to perform regularly with the likes of Tiesto, Paul Van Dyk, David Guetta, Judge Jules, Richard Durand, and Matt Hardwick both in the UK and abroad. Steve brings his energy behind the decks to the netwaves in a brand new weekly show "Clinically Insane", every Tuesday starting April 3rd at 3:00 PM Eastern / 20:00 UK / 21:00 CET on Party107!